As the Chinese hunger for raw materials grows, so does impetus for growth in some of Russia’s most remote and neglected territory. Serving up Chinese food with lashings of mayonnaise for his Russian clients, restaurant owner Liu Yanzhao is one of many Chinese entrepreneurs hoping to make money in Russia’s Far East. Mr Liu is one of the many Chinese businessmen who are hoping to make money in the resource-rich expanses of Siberia and the Far East. With thousands of miles of unexplored forest and tundra, Russia’s Far East is sparsely populated, with only 6.7 million people. But what it lacks in people it makes up for in natural resources, with rich seams of iron ore, rare earth metals, gold and coal, which China needs to feed its hurtling economic growth. Relations between Russia and China, which fought a border war in 1969, have long been marked by mutual suspicion. In the past, that hampered cross-border economic co-operation. But the benefits of trade and investment are beginning to erode old enmities. Chinese investors have set up special economic zones in places including the Amur Region and the Primorye and Khabarovsk territories, as well as the Jewish Autonomous Region (created by Stalin in the Thirties), investing $3bn (£1.9bn) in various new projects. That compares with less than $1bn (£618m) in direct state investment allocated for the same areas by Moscow in 2011, Russian press reports say. The Russian government has said that it wants to invest $100bn (£62bn) to develop the region over the next five years, and that China will be a key partner in building roads, railways and ports. “We know that Russia needs to co-operate with another country to open up the Far East and the natural partner is China, which has far more financial resources than either Japan or South Korea,” says Boris Krasnojenov, metals and mining analyst at Renaissance Capital. The economic crisis of 2008 made China look at ways to diversify its supply of raw materials, from iron to coking coal, much of which it had imported from Australia and Brazil. Russia was a natural alternative, and the economic crisis also made Russian companies aware of their need for foreign investment. The K&S iron ore project at Birobidjan, the capital of the Jewish Autonomous Region, is a good example of Chinese and Russian co-operation in action. A seam of iron ore laced with titanium and vanadium runs across the Sino-Russian border. China’s iron mines have been depleted but its mills need to be fed, so Hong Kong-listed IRC, which raised $241m (£149m) in an initial public offering last year, is developing mines on the Russian side of the border. The Kimkhan mine, which is the first stage of the K&S project, is currently producing about 1.2 million tons of ore, which is now being exported to China, and IRC plans to export 10 million tons a year to China once a bridge is built to connect Birobidjan with its largest market just across the Amur River. The new bridge would halve the ore’s transportation costs of $12 (£7.40) a ton, and construction of the bridge is due to start by summer. “This area is a hugely exciting one for companies like us and we would welcome new companies in the region, which would increase investors’ comfort,” says Jay Hambro, the executive chairman of IRC. Not surprising then, that project financing for IRC’s K&S project was arranged by China’s ICBC bank and the China National Electrical Engineering Company (CNEEC). CNEEC is one of the Chinese companies working to develop the K&S mine, which is also providing jobs for Chinese workers. 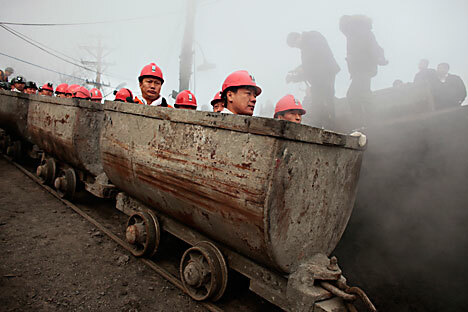 “We use Chinese workers to develop the mine. It’s a win-win for everybody,” says Svetlana Kostromitinova, a mining analyst with Petropavlovsk, which owns a controlling stake in IRC. Enthusiasm for the Chinese presence is not universal – many locals are wary of the gradual penetration. “The growth of China so close to our borders is really frightening. I know they want to invest, but many of us fear they will then want to control things here,” says Svetlana Ivanova, a secretary in Blagoveshchensk.